When we here at Super Heroes Central decided to write about the Flash’s powers and abilities we figured we knew it all, he’s just a guy that runs really, really, really fast isn’t he? (along with some superhuman durability to withstand those speeds). As it turns out the Flash has a lot more powers than we realized making him one the powerful members of the justice league, he is also along with Superman, Batman, Aquaman, Wonder Woman, the Green Lantern and the Martian Manhunter one of the founding members of the Justice League of America. In fact there could be case for stating that he may be it’s most powerful member, but we’ll let you decide that for yourself. 1 How Did The Flash Get His Super Powers? 2 What Are The Flash’s Super Powers? How Did The Flash Get His Super Powers? 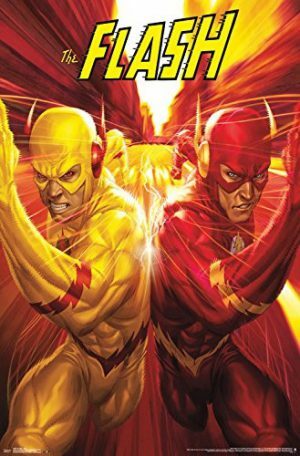 The first thing you have to understand about how the Flash got his super powers is that he has been a comic character since 1939, and there have been multiple flashes, and alternate origin stories and explanations for the Flash’s powers and abilities. But we are going to focus on Barry Allen, who while not the original is the most recognizable and continues to be the default Flash in most modern mediums. In DC comics Showcase #4 the then new character Barry Allen was first introduced, he was a police scientist, and he gained his powers when was covered in chemicals which fell from a shelf and spilled all over him after they had been struck by lightning. giving him lightning fast speed. Simple right? But in the modern age A new element was introduced to that origin story, the Speed Force, which caused the lightning strike, this force is a sentient cosmic energy which has existed since time began and which is a representation of reality in motion, in essence it is the force that moves space and time forward, this sentient energy field selects vessels which it empowers with it’s energy to be it’s agents(although it remains unclear how much the vessels themselves know of their purpose or the Speed Forces goals) what is clear however is that with this story element came a whole range of upgraded powers. What Are The Flash’s Super Powers? The Flash can time travel, this one was just a natural comic book eventual evolution, if you have a guy that can run faster than the speed of light than eventually he’s going to time travel(he used to do it via a device called the cosmic treadmill) but now he’s just fine doing it on his own. 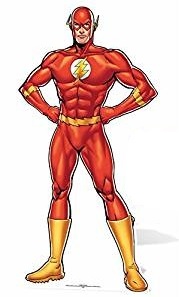 The Speed Force also enhance the Flash’s ability to heal although not a true regenerative super power(if he loses a leg, he will be hopping really fast, cause it’s not coming back) it is still ahandy ability to have, even more so because he can transfer it to other people, helping them to heal faster too. What a guy. As stated before the Flash can do everything really fast, and this includes reading meaning he can speed read vast amounts of words, because the neurons in his brain are firing so rapidly, but generally speaking he will only retain what he has read in his short term memory and so will forget most of what he reads after a short period of time. So the question really is, is the Flash the most powerful superhero in the DC Universe? There is a reason why this is a distinct possibility is because The flash has one other power that we feel is worth a mention, fans have named this ability the infinite mass punch. The way it works is that when the Flash reaches light speed or near light speed his mass increases (to supposedly near infinite levels) and then when he hits someone it is really, really, really hard(and the Flash himself is protected from any negative effects by the Speed Force). So when you combine all these powers and abilities it makes him a formidable superhero, maybe even a match for Superman. Check out this great You Tube clip and get the facts. Enjoy.